This is a classic dish that a.) has nothing to do with cowboys and b.) does not contain caviar. Why the name? Who knows? Just know that it is light, delicious, healthy and packed with fresh vegetables. Serve over greens, as a side dish or with warm tortilla chips as an appetizer or light lunch. I love serving the caviar with grilled meats, chicken or barbecued ribs. It also is nice as a dip trio with guacamole and tomato salsa as the other two items. I have decided that my Easter menu this year will consist of a variety of salads and spring vegetables served with a glazed baked ham and homemade biscuits. 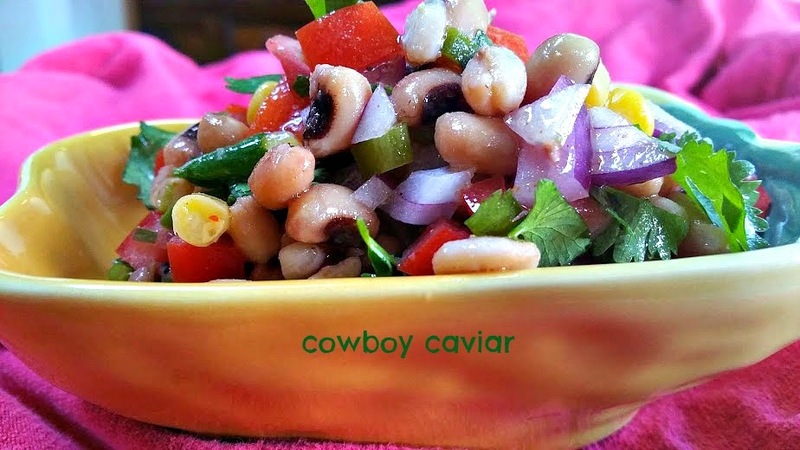 The cowboy caviar will be one of the featured items...delicious with the ham. This menu just screams spring to me, now let's hope the weather forecast holds. It is supposed to be 68 degrees and sunny. That would be perfect! Happy Easter everyone. Add olive oil and vinegar to medium sized bowl. Season with salt and pepper. 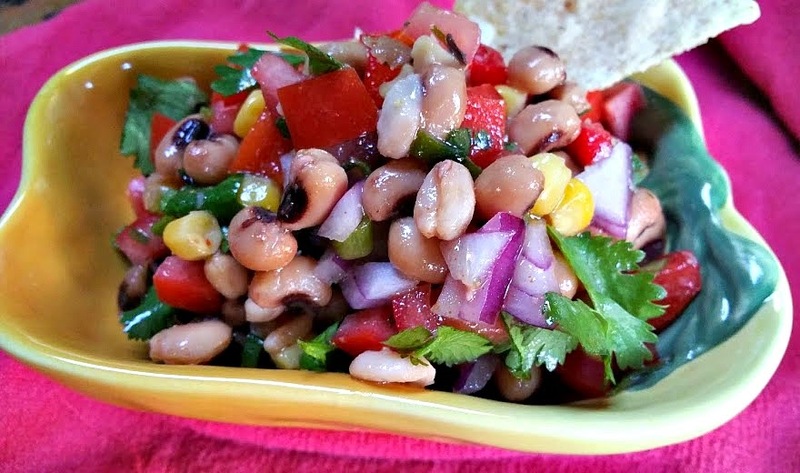 Stir in black-eyed peas, corn, red and green onion, bell pepper, green chile, tomatoes, jalapeno and lime juice. Refrigerate for a minimum of two hours, occasionally stirring. Just before serving, stir in cilantro. Taste and adjust seasonings if desired. 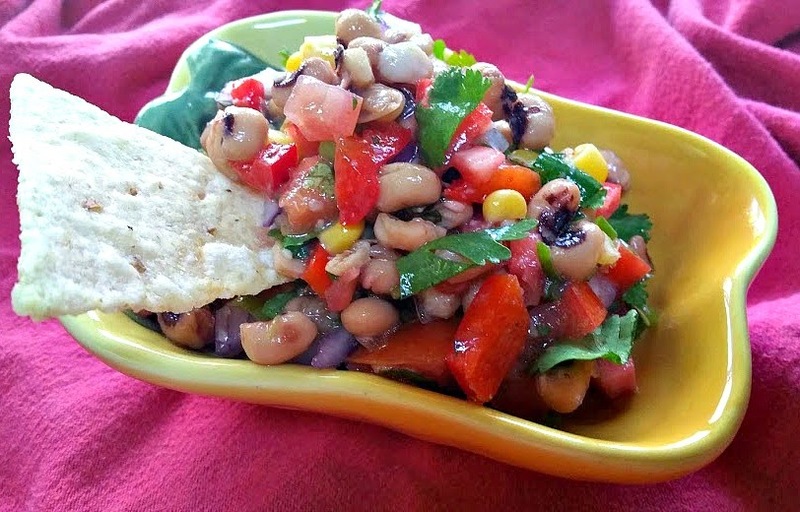 Serve as an appetizer with corn tortilla chips or over greens for the salad course. Springtime means the start of sensational side dishes made from fresh, just-picked produce and this week at Food Network we are celebrating Easter Sides. Do you have a favorite Easter recipe? Share in the comments section and link to your blog if you have one. Be sure to check out the delicious sounding recipes from my blogger friends and Food Network.